More Americans get news on Twitter and Facebook than in the past, according to a new report by Pew Research Center in association with the John S. and James L. Knight Foundation. The survey of 2,035 U.S. adults sheds light on Americans’ evolving news and information habits on the two platforms. 1More users are getting news on both sites than in the past. Nearly two-thirds (63%) of Facebook users and the same share of Twitter users get news via each of the social media sites. This is up substantially from 2013, when about half of each social network’s users (47% for Facebook, 52% for Twitter) reported getting news there. (In both studies, we defined news as “information about events and issues beyond just friends and family.”) This increase in exposure to news among users emerges even as overall usage of each site has remained steady since 2013: 17% of U.S. adults use Twitter and two-thirds (66%) use Facebook. 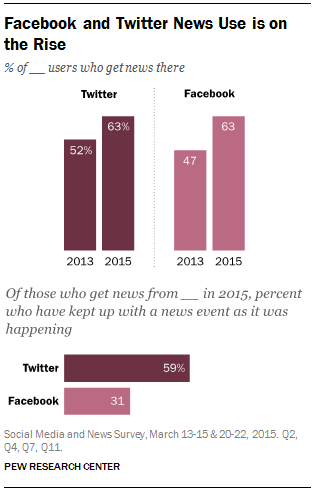 Overall, 10% of all U.S. adults get news on Twitter, and 41% get news on Facebook. 2The percentage of Twitter users who follow breaking news there is nearly twice as high as that of Facebook users. While the share of users who get news on each site is about the same, Twitter news users are more likely than Facebook news users to depend on the social network for breaking news. Nearly six-in-ten Twitter news users (59%) use the site to keep up with a news event as it is happening, which is almost double the rate among Facebook news users (31%). 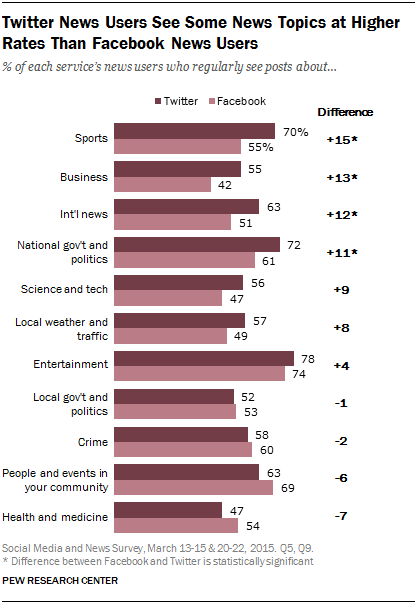 3 Twitter news users see a somewhat greater mix of topics than Facebook news users. Two-thirds of Twitter news users (67%) regularly see at least six of the 11 news topics we asked about, compared with 57% of Facebook news users. When it comes to the individual topics, four are seen at higher rates among Twitter news users than Facebook news users: sports, business, international news, and national government and politics. News users of both sites are roughly on par with each other for the remaining seven topics. 4 Facebook users are more likely to post and comment on political content, whereas Twitter users are more likely to follow news organizations and political parties. 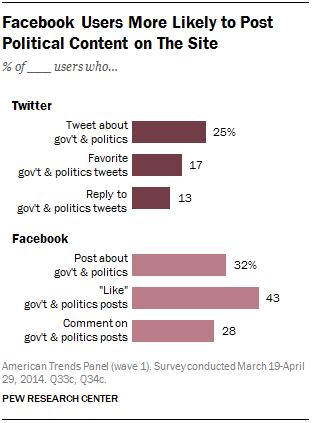 About a third (32%) of Facebook users post about politics and government, compared with a quarter (25%) of Twitter users. (These figures refer to all users, not just news users). Additionally, about three-in-ten (28%) Facebook users comment on posts about government and politics and 43% “like” posts. On Twitter, only 13% of users reply to such tweets and 17% “favorite” them. Twitter users, on the other hand, are more likely to follow news organizations, reporters or commentators (by following, friending or liking a page) than Facebook users (46% on Twitter, 28% on Facebook). The same is true, though to a lesser extent, when it comes to following political parties or candidates (30% of Twitter users, 23% of Facebook users). 5The increase in the share of users getting news on each platform cuts across nearly every demographic measured – gender, race, age, education and household income. There was not, in other words, any one demographic driving the shift. Use of Twitter for news, for example, grew between 2013 and 2015 among users under 35 (from 55% to 67%) and those 35 and older (47% to 59%). On Facebook, news use grew among both males (44% to 61%) and females (49% to 65%), as well as households with incomes less than $75,000 per year (47% to 63%) and those making $75,000 or more (46% to 63%).